420-001 - I Can't Wait That Long - is the first of 13 comic books by veteran animator and illustrator Verne Andru. Principally a science fiction story, 420 blends science fiction, dark comedy and gritty realism into a story that's just plain fun. With a nod to Cheech and Chong, The Fabulous Furry Freak Bros. and Fritz The Cat, 420 follows the adventures of down-and-out roadie, Hal Lighter, as he gets caught up in the middle of an extraterrestrial turf war over the planet Earth in his attempts to win the favor of his secret desire, Marion Jones. In the process, he stumbles upon some extraterrestrial herb that transforms him into Captain Cannabis, a superhero who is about as far from politically correct you can get. This first issue, written for mature audiences, introduces the main characters and sets up the drama that unfolds over the remaining books. 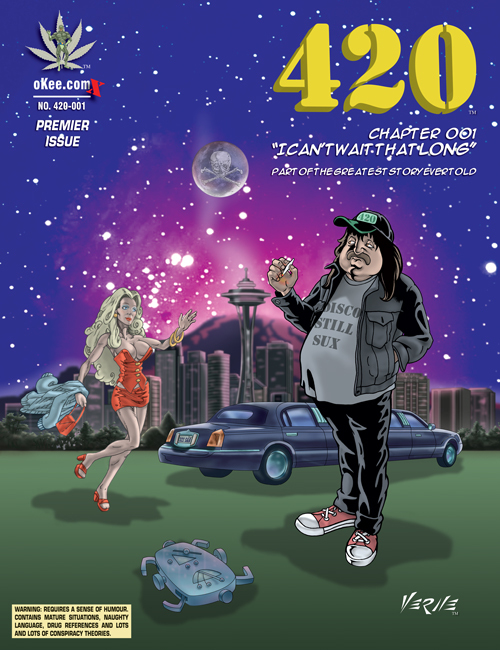 Unlike conventional comics, 420 is written in a feature-length animated screenplay format. Drawings are prepared to feature film specifications, and then given a color treatment, before being published in this series of Heavy Metal format illustrated books. Once all books in the series have been completed, so will the artwork for the film that will be released on DVD. 24 pages, including cover, of full colour 420 fun. Includes first 7 x 420 movie sequences in high resolution colour, The Story behind The Story and more. Artwork is produced to feature-film specifications for the animated movie, comics, interactive gaming & the web. The Captain Cannabis in 420 series is destined to be a collectors item. Click here to check out the first 4 pages! Orders directly from the publisher payable by postal money order, bank draft or certified check. Email "contact at okee dot com" or "420 at captaincannabis dot com" for details. Thanks for your support. Proceeds from sales are what make this projects like this possible.